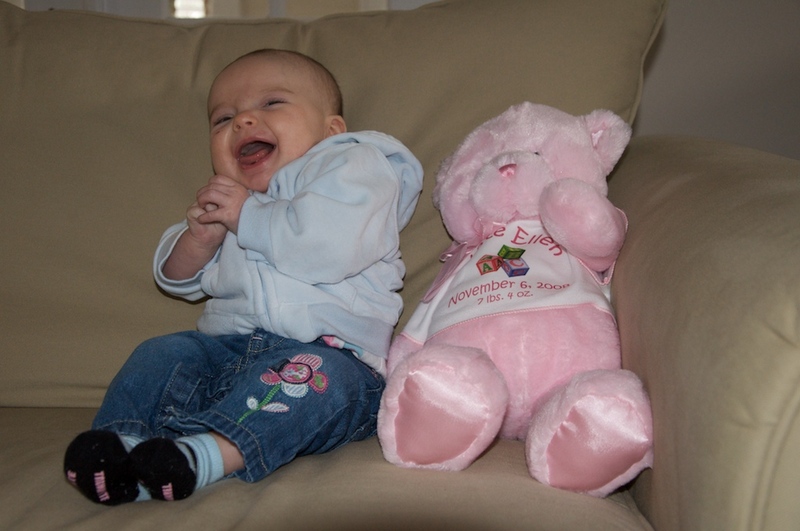 Kate has a big smile on her 3 month birthday. Wow – has time flown! Today is Kate’s 3 month birthday, and we couldn’t miss and opportunity to make brownies and sing Happy Birthday to our precious daughter. Enjoy the video. It’s been a little while since we’ve had blog entry. We apologize. Time, as you can see, has gotten away from us. I hope to make more of the blog entries going forward as John tackles other tasks. Kate has changed so much. She is cooing at regular intervals, holding rattles, smiling at mom and dad often, kicking her feet, putting her fists in her mouth, and wanting to roll over (not yet but so close). We are having a lot of fun. It seems like every day there is a new discovery. Kate is also enjoying her nightly baths and story time. It’s funny, as new parents we celebrate such tiny milestones. I was thrilled last night when I noticed she was actually looking at the pictures in ‘Goodnight Moon.’ It took a couple of times, but I’ve learned not to read to her with the tv on in the background as that was capturing much of her attention previously. Kate is shoving her fist in her mouth. That scratch is her first injury from her fingernail! Kate also enjoys interacting with other babies her age. Each week, I get together with other new moms and our babies. Don’t tell Dad, but yesterday Kate was very interested in holding hands with her friend Will. I am sure there will be more to come which may commence the gray hairs on Dad’s head. Happy 3 Month Birthday, Kate! This entry was written by jennifer, posted on February 6, 2009 at 8:41 pm, and filed under Uncategorized.